How does one get from that initial nudge to the inspiration and perspiration to actually get it done? While each of us will take a different path and have our own experience, following is my expose` of the good, the unexpected, and the miraculous which I hope will serve you in your own publishing adventures. I’m writing it around the key questions I believe any of us needs to explore to move from machination to masterpiece. Exploration #1. What do you want to say? What is your core message? What matters enough to you to stick with the process? Just as in speaking, there is little point to writing a book without clearly defining what it is you have to say – and why you’re the one to say it. My intention was to synthesize the message and training of Real Speaking to make it accessible to change artists in every arena who may not be able to attend a “live” session. 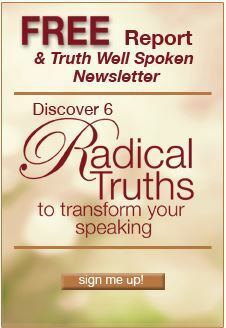 I also wanted to get the word out about the transformational work of Real Speaking to attract clients committed to a better world. Exploration #2. How will you structure what you have to say? For me, this was a moving target. How was I to translate what is an experiential and individual process into something of value to the reader? At first I thought I’d write an e-book called “Seven Days to a Great Presentation” to get some of the fundamentals down on paper. Each month for about six months I met my editor and cheerleader Elizabeth Wolf for breakfast. Elizabeth would take copious computer notes and then organize and feed back to me what she’d heard. We developed an outline at which I stared, nearly comatose. I had no juice for it! But the process clarified that what I really wanted to do was find a way to talk about the inner journey of finding and trusting one’s voice so readers could use the Real Speaking method to begin the journey to becoming powerful and passionate communicators. Developing the structure was a hang-up that immobilized me for months. I assumed that until I had the book outlined I couldn’t start writing. So I pondered the possibilities and made a few stabs at it but allowed its imperfection to stop me from moving forward for quite some time. Elizabeth patiently explored and added ideas while the initial structure changed several times. This was the most frustrating part of the writing process for me. Each time the structure changed, I had to revisit everything I’d already written to be sure it would flow for the reader. This is the creative process, after all, and the fact that frustration is almost guaranteed did little to alleviate it. I remembered what George Land says, “The pain pushes until the vision pulls.” The vision of what I wanted to create was a powerful pull forward. Exploration #3. How will you make uninterrupted time to write? My decision to write came about a year earlier when my I was agonizing about a speaking engagement I wish I hadn’t accepted. My dear friend Runa Bouius suggested I spend time writing instead of accepting any assignment that didn’t make my heart sing. I decided to heed her advice. For those of us whose work lives are not devoted to writing, I now completely understand why Virginia Woolf extolled the sanctity of “a room of one’s own.” Peggy Taylor and Rick Ingrasci offered me their home on Whidbey Island, Washington, in July and August of 2007, providing the impetus not only to write but also to answer a soul call to both place and community. Then, once the initial draft was in Elizabeth Wolf’s capable hands for editing, I was offered a fellowship at Hedgebrook, a writing retreat on Whidbey Island for “women authoring change,” to complete the manuscript. How could one not be inspired in a private cabin in the woods with healthy meals and lavish comfort food? Before going to Hedgebrook for ten days in October, with one more blasted restructuring to complete on a quick deadline for the review of a second editor, I checked into Sunrise Springs, a quiet retreat and spa on the outskirts of Santa Fe, where the land nourishes me and allows me to “drop in” to the inner space from which comes my best work. The staff graciously moved a big table under the window in my room overlooking the expansive grounds and springs. Those were the most challenging days of the writing process, and being away from the distractions of home and office was the key to staying focused. Exploration #4. How will you blast though writer’s block? Once I got to Whidbey, ostensibly to write my book, I went to bed and read three novels in the first week. I might have spent the entire summer in a self-induced stupor had I not received a phone call from Ariella Tilsen in Minnesota. I’d met Ariella at a rather unfortunate workshop in 2006 where we bonded, through humor, around our mutual despair about the program. Her husband is a writing coach, and just that morning she had heard him advise a client to “write three pages a day, even if they are really crappy pages, double spaced, in large type.” When she reported this wise counsel, I said, “I can do that, and by the end of the summer I’ll have written 150 really crappy pages!” I started as soon as we hung up, ending my resistance once and for all. Some days I’d write for twelve to sixteen hours, amazing especially myself. Exploration #5. How will you choose an editor? My editor, Elizabeth Wolf, is both a friend and a client. Because she had done the work of Real Speaking, she was the perfect editor for me, combining professional expertise, commitment to the message, excitement about the project, and an encouraging style that kept me on track. In fact, she found the book so compelling, it reactivated the work she did in Real Speaking, and she has now claimed her voice and is committing her full efforts to her calling, which means she is no longer available for editing. When Elizabeth suggested a fresh look would be valuable, I contacted another client and colleague, Linda Solomon, a journalist, teacher of writing, and editor of the Vancouver Observer. I had read and admired Linda’s writing, plus I knew she would view my manuscript through another lens, that of change agents and activists. Linda, like Elizabeth, provided not only editing skill but also penetrating insight. And she was willing to jump in on a two-week deadline to prepare me to complete Transformational Speaking at Hedgebrook. Her frequent notes “I love this!” or “This one page is worth the price of the book!” were as welcome as her challenging questions. (Actually, more so, but it was all good.) She didn’t let me get away with saying anything that wasn’t absolutely clear to her. She also remembered many examples from a Spirited Speaking class she had taken with me at Hollyhock Retreat Centre and kept asking for even more stories, stories, stories! Exploration #6. Who will publish your book? I was clear on my strategy, which is one I recommend to speakers who already have an audience. Write what you want to communicate, your way (with professional editing and support, of course), and get it out there. You can then look for an agent and a publisher if you want; in the meantime, your book has taken wings. Yes, you can begin with the effort of writing your book proposal, submitting it to literary agents, waiting to see if an agent wants to represent you, and once successful, waiting again to hear from the publishers to whom they present it. An agent will sell your book based not only on its intrinsic value and quality but also of that of your “platform” (your capacity to sell lots of books to make their investment worthwhile), and other vagaries of the marketplace. While many authors start here, I have worked with a sufficient number who sold their books based on a book proposal. Then, the editor who initially championed the acquisition either had quite a different idea of what the book should be or left the publishing house midstream leaving the book without in-house support. Traditional publishing is also a time-consuming process; you may not see your book in print for a couple of years. Ask yourself: How old do you want to be when you see the fruits of your labor? 1. It was fast. Once I had my book written and edited, I saw my first copy within two months using their Select Publishing Package. They have other packages offering professional evaluations and advice, but time-to-market was more important to me because of a January speaking engagement at a large conference. 2. The production was inexpensive. My initial investment was $599 for the layout and, ostensibly, a cover (more about the cover later), and distribution through Amazon and Barnes and Noble online listings as well as a listing in Books in Print at bookstores. 3. There was no need for me to order and keep an inventory of books or fill orders. People order online and order fulfillment is included. Of course, I pay for my own copies, with author discounts up to 45 percent for 100 copies. 4. The royalties are slightly higher than with traditional publishing: 20 percent compared to 10 to 14 percent..
5. I retain all rights to my book and can sell the book to a publisher at any time and take the iUniverse edition out of print. Another good option chosen by many of my clients is to self-publish. Many speakers choose this because when you have the audience and energy to sell a lot of books yourself, you reap all of the profits rather than sharing them with a publisher. This choice requires that you buy independently all the services mentioned above, and you own your inventory. A highly respected resource for this approach is Ellen Kleiner of Blessingway Authors’ Services The Blessingway website provides solid information on this option, and I’ve never seen a book Ellen has shepherded through the process that was not a masterpiece. In fact, I met Ellen through my client Margaret Jacoby-Lopez, whose award-winning Sing Past Winter: A Modern Psalter, is a fine example. Another is Sankara Saranam’s God Without Religion, which received five awards and is being printed in seven countries in six languages. He built a storeroom for his first order of one thousand copies and they fortunately did not languish. His second printing went directly to a distributor, Sankara having had quite enough of hauling and storing books! Exploration #7. Who else do you need on your team to provide timely advice and support? The answer to this question will be your surprise as you embark on your own journey. You’ll need good proofreading once you see your page proofs. Elizabeth Wolf looked over mine and taught me a new language of “orphans” and “widows.” (Ask an editor.) My friend Sandy Miller cast her eagle eye on the whole thing and found other needed corrections. My biggest surprise, one that required calling in immediate reinforcements on my team, was my cover design. I mentioned above that my package with iUniverse included the cover, and I’ve seen some good ones they have produced. So when I received word by e-mail that my cover was attached, I was filled with anticipation. They missed the mark by so far it was laughable. (Really: compare the glorious transformational image of a swan with a red, white and blue design depicting an angry young white man shaking his fists in front of a skyscraper!) When I talked with Phil Whitmarsh, my sales contact at iUniverse about it, he recommended that you always provide guidance on what you want to accomplish to give the designers something to work with, even if it is only the “feel” you want. Earlier he had recommended I use my photo as the cover, which held no appeal for me. I felt there was something else that wanted to happen, but it was indefinable so I left it up to them. If you’re buying an inexpensive package, either be very clear or prepare to have your own cover designed. Because of my deadline, I had to move quickly. I spent hours online looking at stock photos but nothing matched the elusive idea I held of finding something that would say it all. I knew I wanted red and gold and something that suggests transformation, and the best I could come up with was a butterfly. The next morning I awakened with image in my mind, something opening up in glorious color. When I walked into my guest room later that day, there it was: a swan taking flight in a painting I had bought from Colleen Kelley three years ago. It is called “Swan’s Song Calls Life at Dawn’s Light.” From Colleen I purchased the rights to use it for the first edition and then hired graphic designer Zi Pinsley to create the book covers. An experienced designer and owner of The Type Doctor, she found the iUniverse studio was best set up to work directly with the author than with a graphics professional. For instance, they had a limited number of fonts for which they were licensed, more user-friendly for those of us who are not tech savvy but limiting for an experienced designer. Zi suggests that an author might consider sending the cover imagery that they want to use if they wish to have the iUniverse studio design the cover. Exploration #8. Do you want to work with a literary agent? Exploration #9. Once you have your book, how do you get it to your audience? This is my next step, and I’ll report on this in a future e-letter. My initial step is letting you on my e-list know it is here. Asking you to recommend it to your networks. Organizing events in Santa Fe and on Whidbey Island. Posting a page on my website. Sending out a news release. Advising those who bring me in to do programs to order books for the audience or their bookstore. One thing I can’t imagine doing is sending out an offer with dozens of bonuses to entice you to buy it. Poet David Whyte said it best, “This is not the age of information . 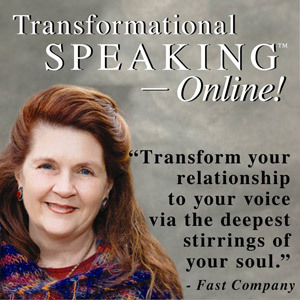 . . people are hungry, and one good word is bread for a thousand.” With information overload, I trust that one good book – in this case, Transformational Speaking – is itself worth far more than the $16.95 I am asking you to invest. So – best wishes on your own publishing adventure. When you hold your book in your hands, as I did mine for the first time this week, you’ll marvel at the miracle that has taken place. And you’ll likely want to sing the praises of all those who helped. It truly takes a village! Included in this Village are my clients, my teachers, and my friends who expand my horizons and are a constant source of inspiration and delight. Because of them, I get a front-row seat for the stories that are transforming the world, one audience at a time. May this be a year of finding and telling the stories that make the world better. Because I’m referencing this article in 2013, let me tell you what happened next. 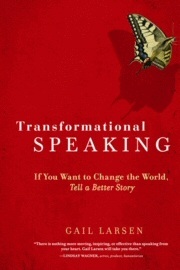 Jeff Herman represented Transformational Speaking and sold it to Ten Speed Press and also Brilliance Audio. (I got paid to go to Michigan for two days to read my book with an excellent recording team at Brilliance.). Ten Speed asked for minimal book edits but did design a new cover – one with butterflies which I like! They wanted the cover to be beige and olive and I clamored for red – after all, transformation is nothing if not exciting and colorful! Then, on the day I was to appear on three television and radio shows in San Francisco, I broke both my legs! So it look my book a bit longer to get its legs, especially with the acquisition of Ten Speed by Random House, where I suspect I got lost in the transition. I requested that foreign rights be returned to me this year and have hired Blessingway Author Services to support sales in other countries. And the Kindle version is now on its way, requiring some contract adjustments to match the Random House royalty schedule. My book is selling steadily and is bringing wonderful new clients to my door who have read it an resonated with my approach. And best of all, I am still proud of it! As for how I would do it differently today, I know there are many more resources and self-publishing packages to be explored. And as my next book idea begins to call to me, I know it is a new world of publishing. I’d begin by talking with Linda Sivertsen at www.bookmama.com . And listening to Danielle LaPorte, who co-authored with Linda Your Big Beautiful Book Plan. Danielle is creating new models each time she writes. May the muse take you away to amplify your voice through your book!